Critically acclaimed indie hack-and-slash Torchlight had tons of randomized dungeons. The sequel will do the same, only more so. Gamers really loved 2009's Torchlight - it was everything we ever wanted in a Diablo clone, at a low price, from a cool indie studio that really cares about its players. The one major flaw with Torchlight was that it had no multiplayer, a flaw which is being corrected (among others) in the sequel. Of course, putting four - or more - players in Torchlight's cramped, randomized corridors could be a bit hectic. That's why Runic is making its worlds significantly bigger for Torchlight II. In an excellent post on the Torchlight II site, lead level designer Patrick Blank (which is a great name for a level designer, I might add) explained how the T2 team was approaching its environments - which, as in the last game, would be (mostly) randomized. Passes are the tightest and most heavily themed zones in Torchlight II, that act as transitions from one area of the game to the next. While still possessing randomized elements and different possible configurations, these seem to be the closest Torchlight comes to genuinely scripted areas. The big zones in the game, though, are the Overworld zones - and like the name would suggest, they're where a huge part of the adventuring takes place. While the Overworld levels will have certain concrete elements - like a river running from end to end of "The Temple Steppes" - they will be completely randomized. 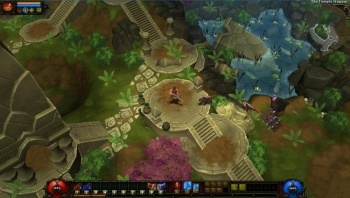 To draw a comparison of size, Blank said that the largest areas in Torchlight were those at the Black Palace near the end of the game, and they were 6-7 "chunks" in size. The typical Overworld, on the other hand, is made up of 18 to 23 of the same "chunks," making it three times bigger than even the largest Torchlight floors. There will also be randomized dungeons, of course. That's where the phat lewt is, and since Torchlight is about phat lewt, that's where you want to go. Blank said that the team had added new types of chunks to the dungeons like three-way marks and dead ends so it would be a less linear experience. Read more on the Torchlight II site. I can't wait for this game - I only hope that Runic can get Torchlight II out the door before Diablo III hits, because then they'll be too busy playing that other game to finish their own.